DORE L.A. SOUL SIDES 2. In the mid-fifties, many small record companies sprung up across America. Especially, in cities like New York and Los Angeles, which are two of America’s musical cities. One of these new labels was Era Records, which was founded in 1955 by two cousins, Lew Bedell and Herb Newman. The two cousins came from very different backgrounds. Lew Bedell had been a comedian, but his career was at a crossroads. So he was on the lookout for a new career. Herb Newman however, was a music industry veteran. He’d started out as a West Coast sales rep for Mercury and later Decca. Having learnt the ropes, Herb wanted to form his own company. With his cousin looking for a new career, this seemed like the perfect opportunity for the two cousins. Herb and Lew were like brothers. This and been the case since Lew’s parents split-up. Lew was born in El Paso, Texas. After his parent’s divorce, his mother took Lew and his sister to New York. They didn’t stay in New York long. Instead, they headed to Los Angeles, where they stayed with Max Newman. Not long after this, Herb Newman was born. The two cousins were brought up as brothers. So it’s no surprise that the two cousins went in to business together. With the financial support of Herb’s father Max Newman, they founded Era Records in 1955. Three years later, in 1958, Doré Records, an imprint of Era Records was founded. The newly founded Doré Records was named after Lew’s first son, who’d been born to Lew and his wife Dolores in 1957. The rationale behind forming a second label was that it would double the chances of having a record played on the radio. Doré Records would also allow Herb and Lew to release much more groundbreaking records. This was the case from the day Doré Records opened its doors. Having released two singles, a young Phil Spector approached Herb and Lew with To Know Him Is To Love Him, by The Teddy Bears. When Herb heard the understated arrangement, he thought that if it was to be released on Era the record would be rerecorded. Phil disagreed. So did Lew. He heard the potential in the To Know Him Is To Love Him and agreed to release the track in its original form. It became a huge worldwide hit. For the next couple of years, Lew and Herb’s opinions on music differed. Eventually, in 1959, Lew and Herb decided to go their own ways in May 1959. It was an amicable spilt. Herb Newman continued with Era Records, but moved the company to new premises. Lew retained Doré Records, which stayed at 1481 Vine Street, Hollywood. Doré Records became Lew’s baby. He was a shrewd judge of character and transformed Doré Records into one of the top independent soul labels of the sixties. That’s why in May of 2014, Kent Soul, a subsidiary of Ace Records released Doré L.A. Soul Sides, a compilation of music released by Doré Records and its subsidiaries Crescent and Horace’s. It was so successful that recently, a followup was released. This was Doré L.A. Soul Sides 2, which was also released by Kent Soul, an imprint of Ace Records. Doré L.A. Soul Sides 2 features twenty-four singles tracks. Most were released on Doré Records. That’s apart from two tracks. The Vows’ I Wanna Chance was released on Markay, while Toussaint McCall’s From Saigon To San Francisco has never been released before. Several of the tracks on Doré L.A. Soul Sides 2 were penned by Lew Bedell using various aliases. Among them, were Lou Bideu, R.W. Chandler and B.J. Hunter. Lew Bedell, it seems had hidden talents. He was a dyed in the wool music man, who was determined to turn Doré Records into one of the most successful independent labels. Playing a part in the success of Doré Records, were many of the artists on Doré L.A. Soul Sides 2. Opening Doré L.A. Soul Sides 2 is the first of two tracks from The Entertainers IV. They were formed in 1965, and released their debut single Temptation Walk in 1966. The followup later in 1966, was My Garden Of Eden. On the flip-side was Gettin’ Back Into Circulation, which was penned by Bobby Swayne and Cal Richardson. 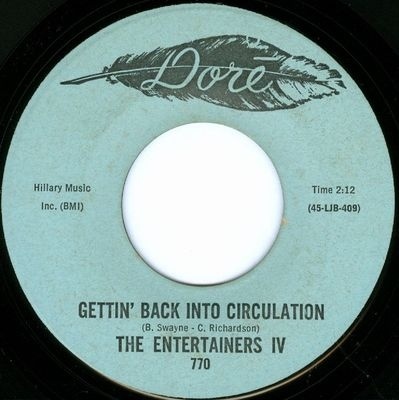 Gettin’ Back Into Circulation is something of a hidden gem, and became a a favourite on the Northern Soul scene. It’s been remixed for Doré L.A. Soul Sides 2. This whets the listener’s appetite for the rest of Doré L.A. Soul Sides 2, including The Entertainers IV other contribution. 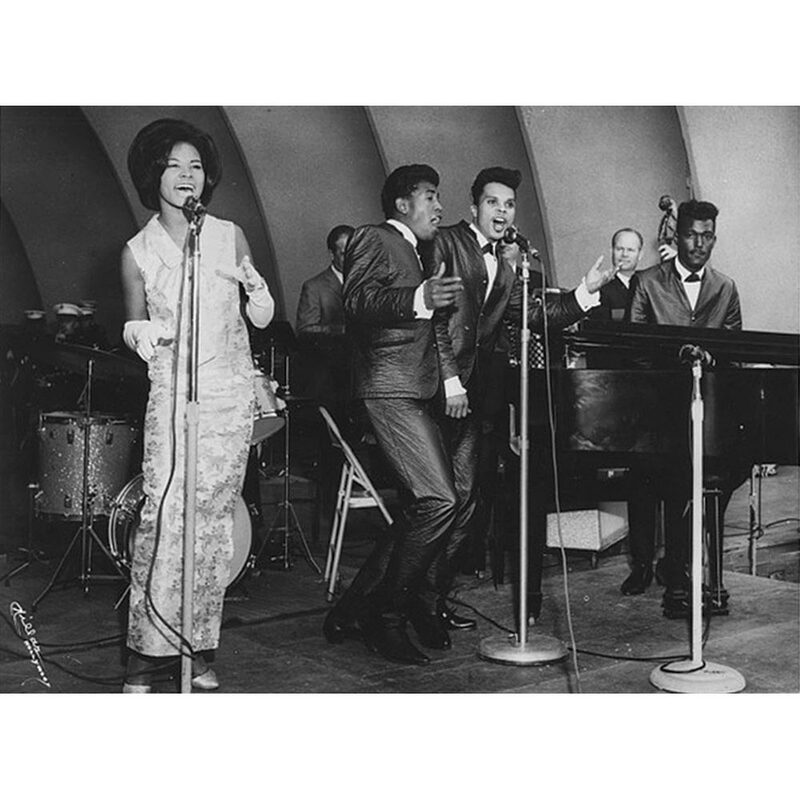 That’s Just Aint My Day, which was released in 1968 was arranged, conducted and written by Richard “Dimples” Fields. He discovered a new lineup of The Entertainers IV. Two members of the band had left, and been replaced. This becomes apparent straight away. Just Aint My Day has the tougher, funkier sound that was becoming popular. However, Just Aint My Day didn’t find favour with record buyers, and only relatively recently, has found an audience. Along with The Whispers, The Superbs were Doré Records’ most successful signings. They were also one of Doré Records’ longest serving groups. Their Doré Records came in 1964. 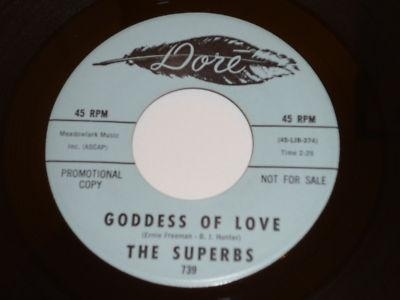 A year later, in 1965, The Superbs released Goodess Of Love in 1965. This Ernie Freeman and B.J. Hunter composition marked the end of an era. Goodess Of Love was Bobby Swayne’s swan-song. Bobby and the rest of The Superbs ensure that Bobby’s left on a high. Soulful, catchy and dance-floor friendly, Bobby bowed out in style. However, The Superbs stayed where they were. Eight years later, and The Superbs were still signed to Doré Records, and released Your Eyes as a single. On the B-Side was Wind In My Sails. Just like Your Eyes, it was penned by Ronald Cook and Lawrence Dickens. It’s very different from Goodess Of Love. That’s not surprising. By 1972, soul music had changed. That’s apparent on Wind In My Sails, which has tougher, funky, arrangement. The Superbs also adopt this tougher sound. Still though, their music can be smooth and soulful, as The Superbs’ music evolves in an attempt that their music stays relevant. Former Superb Bobby Swayne cowrote Funky With My Stuff with his brother Billy and Antoinette Perry. The three of them then became The Natural Resources Unpolluted. Funky With My Stuff was released in 1971. Soulful and funky describes a track that seems to have been inspired by The Temptations’ Ball Of Confusion. It’s definitely a case of imitation is the sincerest form of flattery, in this homage to The Temptations. Before releasing That’s What Love Will Do, Milton James was a member of The Creators. They joined Doré Records towards the end of 1965. By June of 1966, Milton James was about to record his debut single. The song chosen was My Lonely Feeling. On the flip side, was a song Milton James and Howard Scott penned, That’s What Love Will Do. This slow, melancholy but beautiful ballad released later in 1966. It’s too good for a B-Side. Sadly, when My Lonely Feeling was released as a single, it failed commercially and is now an extremely rare record. Both sides would later be rerecorded by the group The Creators became, War and at one point, were staples of their live shows. One of the earliest recordings on Doré L.A. Soul Sides 2 is The Darlings’ My Pillow. 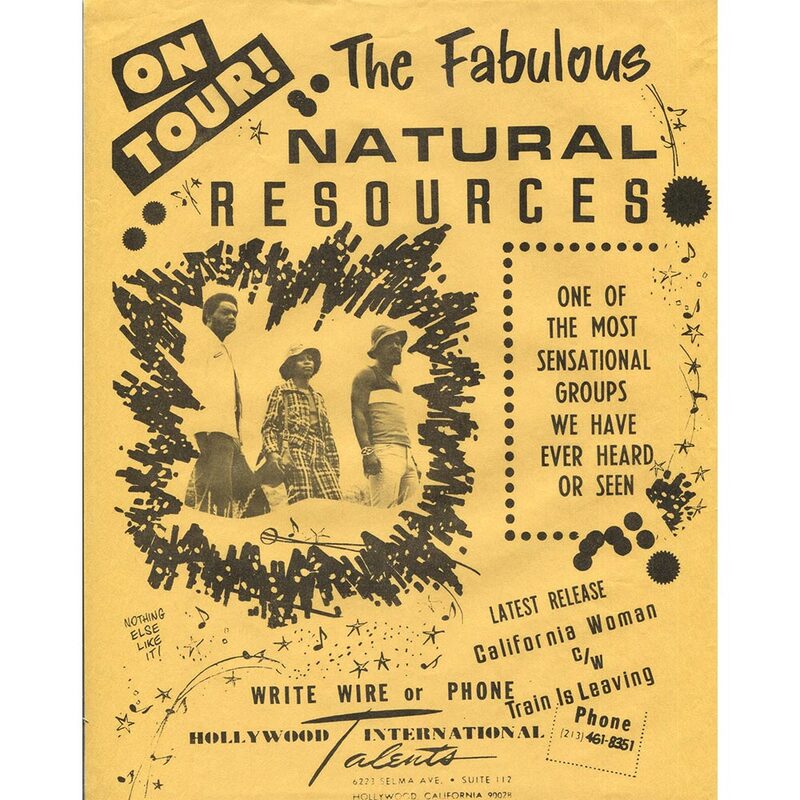 The Darlings were a Los Angeles’ based quartet, that featured Julia and Maxine Walters. They would become part of the family band The Walters, and later, become song of the most in-demand backing vocalists. In 1963, that was still to come. Back then, The Darlings were managed by Bobby Sanders, who produced My Pillow. It was arranged by Gene Page and released in 1963. 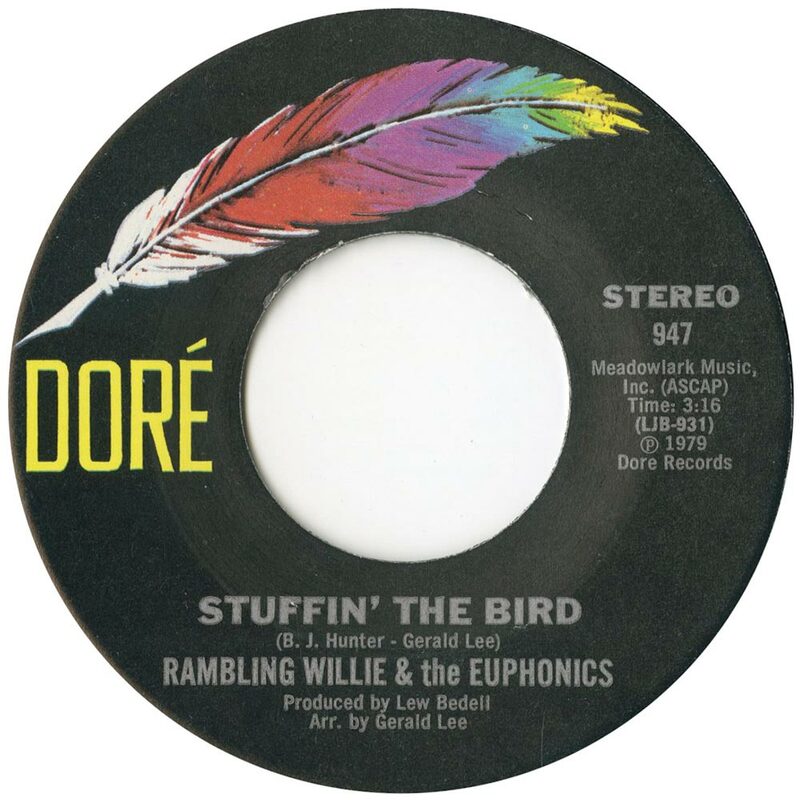 Elements of soul and doo wop shine through, on what was the first of two singles The Darlings’ released Doré Records released. 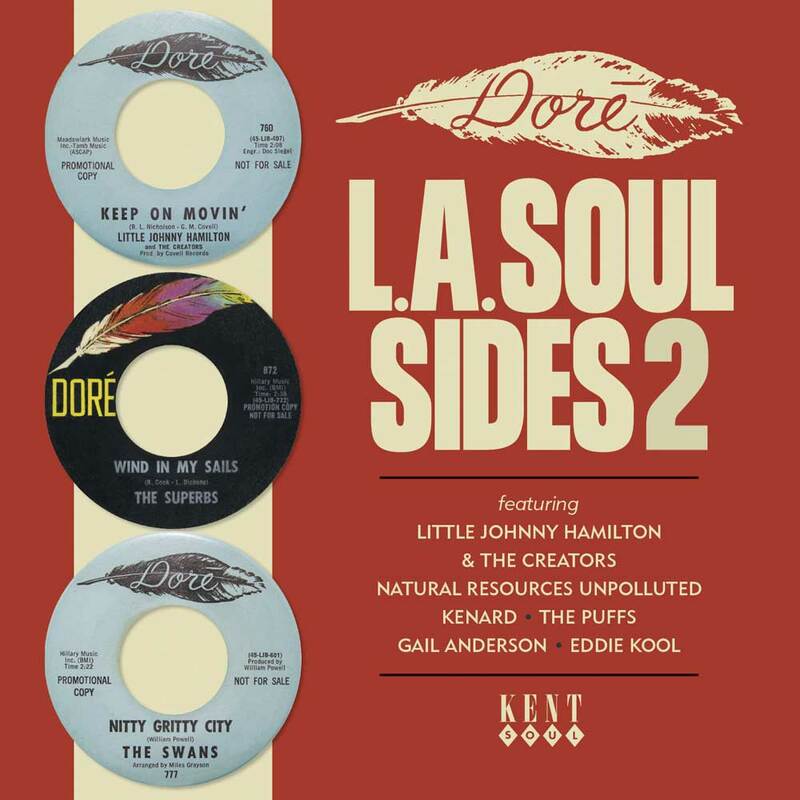 Little Johnny Hamilton and The Creators released Keep On Movin’ in March 1965. It was penned by Gilbert Colvell, the band’s manager, one of The Creators, Bobby Nicholson. It’s without doubt the rarest record on Doré L.A. Soul Sides 2. Only one copy is known to have survived. As a result, it’s impossible to put a price on this track by one of the most underrated soul men who passed through Doré Records’ doors, Little Johnny Hamilton. Without doubt, the best way to describe The Swans’ Nitty Gritty City is as a stomper. That’s the perfect description for Nitty Gritty City. It was penned by William Powell, and arranged by Miles Grayson. When Nitty Gritty City was released in 1966, this joyous, anthemic, stomper passed record buyers by. Over the last few years, its found favour within the Northern Soul scene. However, record collectors wanting a copy, will be hard pushed to find a copy. It’s another rarity, whose price will be beyond most people. So, its inclusion on Doré L.A. Soul Sides 2 will be welcomed. Unlike many soul labels, Doré managed to survive the seventies, when when soul fell out of favour. 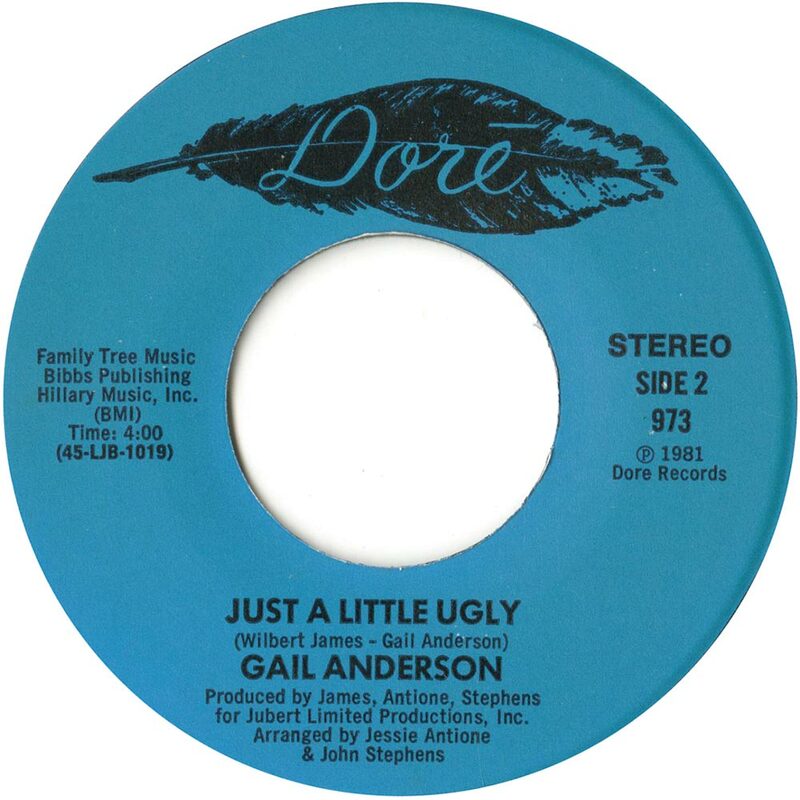 By 1981, Doré were still going strong and had released Gail Anderson’s single We Communicate. On the flip side was Just A Little Ugly. This was a song she wrote with Wilbert James, who co-produced the song with Jesse Antoine and John Stephens. Just A Little Ugly is another song that falls into the category of hidden gem. Against a funky arrangement, Gail delivers a gospel inspired vocal tour de force. It veers between powerful, emotive and sassy.Why Just A Little Ugly was relegated to a B-Side seems a strange decision. It deserved better than that. My final choice from Doré L.A. Soul Sides 2 comes courtesy of Eddie Kool, a.k.a. Eddie Williams. He penned I Look In The Mirror, which was arranged and produced by Bobby Day. It was released in 1968, and showcases a soul-baring ballad from Eddie Kool. It’s the perfect way to close Doré L.A. Soul Sides 2, as it leaves you wanting more and hopefully, Doré L.A. Soul Sides 3. Not only does Doré L.A. Soul Sides 2, pick up where Doré L.A. Soul Sides left off. It was the perfect introduction to Lew Bedell’s Doré Records. The recently released Doré L.A. Soul Sides 2 continues the Doré Records story. For over twenty years, Doré Records released innovative and exciting music. That’s what Lew Bedell set out to do when he founded Era Records in 1955. Four years later, and Lew and Herb decided to go their own ways in May 1959. With a steely eyed determination, Lew Bedell set about turning Doré Records into one of the leading independent labels in America. He succeeded in doing so. There’s a reason for this. Unlike many of Doré Records’ competitors, Lew Bedell ensured his label evolved. He knew that music was constantly changing. It didn’t matter what genre of music, it was always changing. The trick was not to get stuck in the past. Lew had watched other labels suffer that fate. He knew that they wouldn’t last long. This proved to be the case. Meanwhile, Doré Records went from strength to strength. Partly, that was because Lew embraced change. Another reason was he surrounded himself with talented people. Whether it was arrangers, producers or songwriters, Lew didn’t settle for second best. Especially when it came to artists. Constantly, Lew Bedell on the look out for talented artists. He didn’t mind if they were up-and-coming or established artists. As long as he thought they were capable of producing a hit record, he would sign them to Doré Records. That was the case throughout the history of Doré Records. It was certainly the case with each and every one of the artists on Doré L.A. Soul Sides 2, which was recently released by Kent Soul, an imprint of Ace Records. Lew Bedell thought each of the artists on Doré L.A. Soul Sides had potential. Sometimes he was right. Some of these artists went on to play an important part in the Doré Records’ story. Others, played a mere walk-on part. However, whether the twenty-four tracks on Doré Records Doré L.A. Soul Sides 2 were hits or hidden gems, they each have one thing in common…,their quality. That becomes apparent from the first time you discover the delights of on Doré Records Doré L.A. Soul Sides 2. ← TOMMY RIDGLEY AND BOBBY MITCHELL-IN THE SAME OLD WAY: THE COMPLETE RIC, RON AND SHO-BIZ RECORDINGS.